Shown here on the Rockingham door style in Maple. Caramel is a Stain  nish. Shown here on the Carmelo door style in Maple. Honey is a Stain  nish. 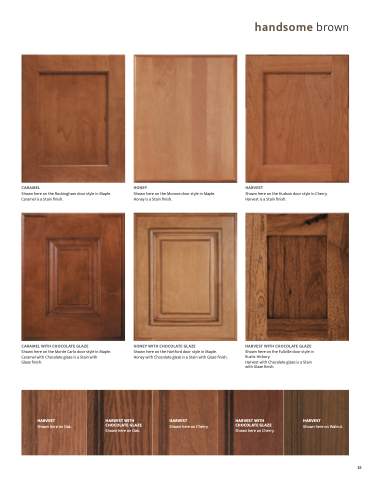 Shown here on the Hartford door style in Maple. Honey with Chocolate glaze is a Stain with Glaze  nish. Shown here on the Seville door style in Hickory. Honey is a Stain  nish. Shown here on the Jamesburg door style in Oak. Honey is a Stain  nish. Shown here on the En eld door style in Maple. Caramel with Latté glaze is a Stain with Glaze  nish.